MrTickTock 2.5 has just been released and published at http://mrticktock.com. This time we have focused primarily on requested "enterprise" features, i.e. 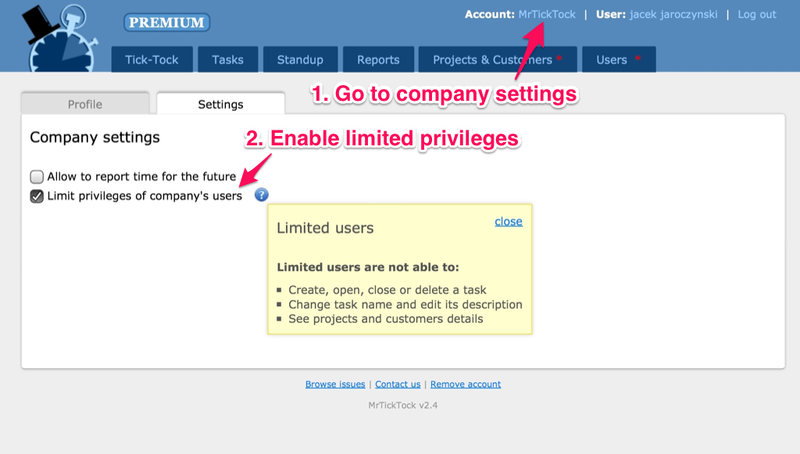 "Allow admin to modify user's timesheet" and "Allow admin to restrict user's privileges". Another important message is that after a long time of being a totally free service, we have decided to add "Premium" plan. It is extremely problematic when user gets sick or goes off for any other reason forgetting her last time report or marking day as off. With this feature admin can edit user's timesheet and sort things out. It is also useful if you want to prepare an account for a new user. We have added a global switch which reduces privileges of all users across the company. 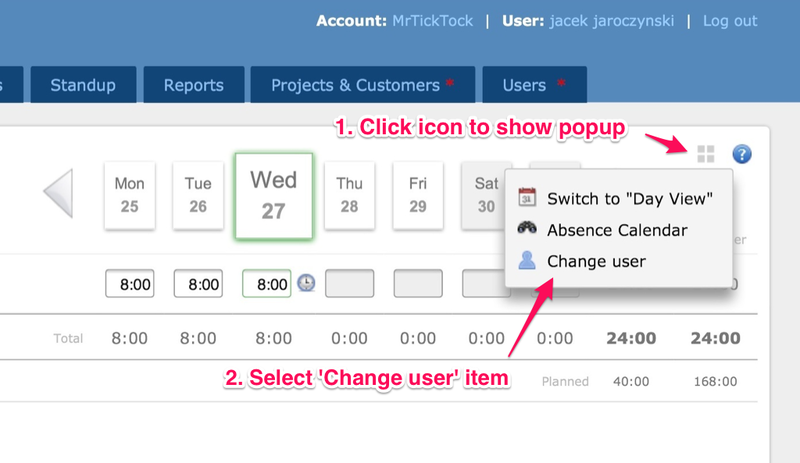 When the switch is on, users will not be able to delete tasks at all (even tasks without reported time), create task, popup projects and customers details. This way all data can be protected against deletion and project/customer data can stay confident and not available to users. Why we did not decide to create another type of user role/level but go for a global switch? The answer is simple: to make your life easier and avoid confusion when you invite new users - "what is the difference between a standard user and a weak user?". In addition to the above features, several things have been improved and few bugs fixed in order to make UX more smooth. Important note: Nothing will change for our existing customers. All the current features will stay free. We worked very actively on MrTickTock development for a long time and the current state of the service suits our needs very well. Nevertheless we get reports from our customers about missing features and shortcomings. Therefore we think it might be worth to put an effort and continue the development process. 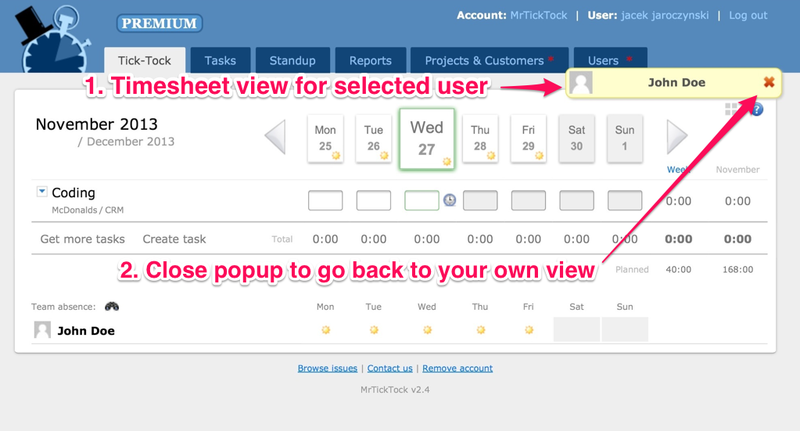 Few more requested features and further UX improvements can make MrTickTock even more awesome and satisfy more people. Software development is costly so in order to fund the further work we decided to add Premium plan with the two "enterprise" features added in current version, i.e. "Allow admin to modify user's timesheet" and "Allow admin to restrict user's privileges". We also plan to add "Vacation request approval" and "Logo branding" to Premium plan in the next release. These features are dedicated to bigger groups and we believe that some of them will decide to pay for Premium plan. Important note: All Premium features will be available to everyone until we introduce payment solution. You can read few more details about Premium plan on the pricing page.